"Just walk. Take a deep breathe then feel the ambiance of Vigan's glorious past that is joining the present and will surely meet the future!" It is Holy Week this moment and this week is a very dramatic week for Vigan City, the only world heritage city in the Philippines. Recently this week, Department of Tourism undersecretary Enerio declared that Vigan is one of the top tourist destinations in the Philippines along with Boracay, Camarines Sur, Cagayan de Oro, Camiguin & Palawan. Well that declaration actually reflected the present Holy Week situation I am going to feature this time. The whole city is crowded by tourists, traffic and a lot more making the city so lively and... stressful. LOL!. Vigan is undoubtedly the most visited city for tourists north of Manila other than Baguio this time. 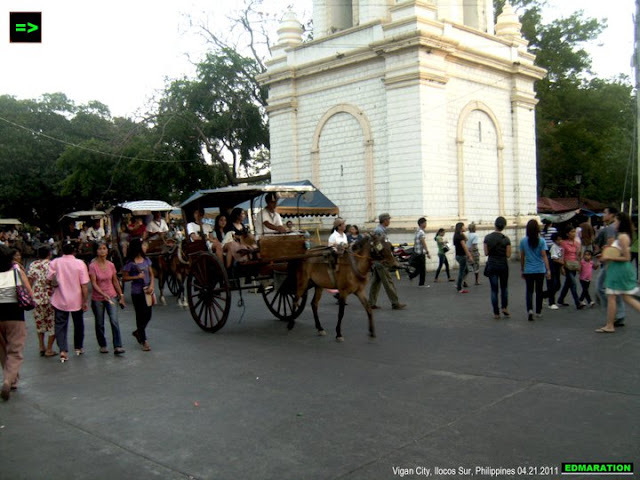 Plaza Burgos has been transformed as an exclusive pedestrian zone this summer season due to inevitable influx of tourists and visitors coming to the city of Vigan. I am going to scrutinize the Holy Week Status of Vigan at this point of time and there are things that I hate and things that I love. Let's start folks! Traffic jam during Holy Week in Vigan City is an expected scenario and a common sight. I believe at this moment, the streets of Manila are drained of vehicles and these vehicles come and create traffic jams in the tourist destinations in Luzon including Vigan. This is the thing I hate the most in Vigan during the long Holy Week vacation because it gives me a lot of stress! Anyway, there are three types of Traffic jam in Vigan and these traffic jams make me wanna eat strawberry jam yeah! LOL! First is the traffic jam for motorized vehicles which includes tricycles, jeepneys, buses, and all those private cars brought by the tourists. Second, the calesa traffic jam. In Vigan, it is not only the motorized vehicles that tangle along the road, calesas too. Calesa is a traditional horse-drawn carriage in Vigan and these calesas have stolen the crown of the jeepneys as the king of the road. In Vigan, calesas are the kings of the road and there are streets in Vigan on which only calesas can enter exclusively. So royal! Next is the human trafficking. LOL! I mean, traffic for human. People are everywhere and they are not just everywhere, they are in every corner of Vigan! A big crowd of people makes me paranoid. I am not accustomed to this kind of scenario. Thousands of people are flocking to the usually peaceful and "quiet" streets of Vigan this Holy Week. In Vigan it has been an old tradition that every Holy Week, some of the major streets of Vigan are closed to give space for goods sold to buyers and shoppers. "Bargeynan Ditoy Vigan" is an annual trade fair that offers Divisoria-price goods for all the tourists and local buyers. Holy Week street shopping in Vigan has been so much fun and exciting because it offers you a wide array of items to choose from in an affordable price. Vigan has been known to be one of the best culinary destinations in the Philippines because of the many Ilocano dishes and other more cuisines that can only be found in Vigan and in Ilocos such as the Vigan empanada, Vigan Longaniza, Pipian, miki, bagnet, poqui-poqui, pinakbet and sinanglao among others. If you try to visit Vigan on a Holy Week, all of these grastronomic offerings are present in the streets of Vigan and the funny thing here is that, the high-end street dining restaurants and the "toro-toro" in the streets of Vigan both offer these foods and the only difference is the price! The taste? Almost the same! Of course, for "sosyal" tourists, I mean for those tourists who love high-end dining and luxury, some restaurants in Vigan also offer high-end street dining for tourists to enjoy! They might be expensive but why not if you have the guts and penny. There are a lot of restaurants in Vigan offering a street dining experience and those 3 I have featured are among those who have set in the best locations. In Vigan, walking at the streets alone is already a bonus for everyone giving you the chance to see and touch the most treasured Vigan heritage structures that you can never see and touch anywhere else in the world but please, avoid vandalism. Let's be a responsible citizen of the world because these Vigan structures have been inscribed in the UNESCO lists of world heritage sites which means, it has a "universal" worth and importance. So, it is not just a Philippine treasure, it is also a universal treasure. Just walk. Take a deep breathe then feel the ambiance of Vigan's glorious past that is joining the present and will surely meet the future!